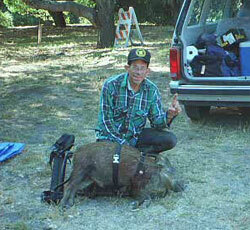 Several years ago, a buddy of mine gave me a copy of the now defunct California Hunter Magazine. In it were two articles that were to change my life forever. One was on hunting public land (turkeys, I think) and the other was on a guided pig hunt with Mark Williams, written by Jerry Springer. This led to a fanatical research of BLM maps, National Forests and military bases. On a return trip from San Fransisco, we stopped in at Fort Hunter Liggett and there I obtained a copy of Bob Robb's book on hunting pigs in California. Then I was really hooked! I continued buying more camping gear, guns, ammo, clothes and more topo maps. I started scouting/hunting all the places that I had researched under the thin guise of family camping trips. It was really great fun for everyone after all. 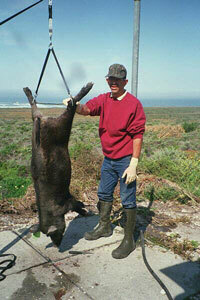 finally caught up with my first wild hog, an 80 pounder that I had to pack back to the van. (See top photo.) This was the culmination of everything that I had learned and a good bit of luck, too. I got my second pig this year. (See lower photo.) Best of all, my son has started hunting with me. Someday we will save up enough money to hunt with Mark Williams, but until then we will continue to hunt the meager public land that is available. But don't fret, we'll have great fun. Thanks, Jerry, for enriching our lives. Best of luck to you and all fellow hunters.